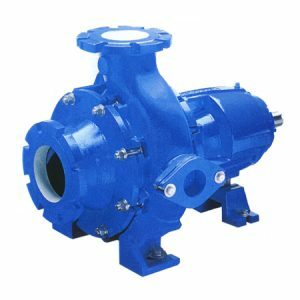 When you need to move heavy material efficiently over long periods of time, screw centrifugal pumps are one of the best options to have installed in your facility. Screw centrifugal pumps combine the flow efficiency of a centrifugal pump with the heavy duty carry and transfer capability of a screw delivery system, which moves heavy material that would clog most any other pump delivery system. Screw centrifugal pumps reduce operations costs because of how quickly and efficiently the material is transported. Combing a screw centrifugal pump with Hayward Gordon chopper pumps will create one of the most effective pump delivery systems possible. Hayward Gordon chopper pumps reduce heavy material to more manageable size for transfer to intended areas. Chopper pumps easily break down heavy material that typically overwhelms other systems, which means less downtime for production lines. Whether you are looking for a screw centrifugal pump, a chopper pump or any other piece of fluid processing equipment, Arroyo Process Equipment has a team of highly experienced and knowledgeable experts that can assess your needs and determine which products will best serve your needs. Our skilled chemical and mechanical engineers can assess your needs to determine your exact specifications. Then, they can create a custom pump package that combines the pumps, gearboxes, drives, motors, strainers, valves, shafts and other fluid processing equipment your facility needs to accomplish your goals. Arroyo Process Equipment partners with only the best manufacturers, so you can rest assured the products we recommend are the highest quality and will perform as expected. We have over half a century of experience of working with professionals in the fluid processing industry, and we have locations in Bartow, Miami, and Jacksonville, FL along with a location in the Dominican Republic. We have a network of global distributors who are available 24/7 to offer installation, maintenance and repair services to customers in Florida, Georgia, Alabama, South Carolina, North Carolina and other states. Arroyo Process Equipment is renowned in the industry for our first-class service, and we are recognized as one of the most respected suppliers and distributors. Contact us today to learn more about the benefits of partnering with Arroyo Process Equipment.